British Gas is to upgrade two million meters to call home with automated readings - but this isn't just about making the gas man obsolete. Automatic meter reading is a great thing - estimated bills are a constant headache for those of us too lazy to read our own meters - but the infrastructure proposed by British Gas goes way beyond reporting back on usage and fits with the UK Government's target of connecting everyone to smart meters by 2020. The deal includes Vodafone, which will be providing the back haul over its GSM network, Landis+Gyr (will create smart meters and a touch-screen hub), Trilliant (will link up all the kit), OSIsoft (will store the data) and SAP, which will integrate the system with British Gas's existing IT systems. The plan is to have a GPRS-capable hub to report back on usage of both gas and electricity, having collected the information from various meters over ZigBee connections, and to present the data on a screen facing the customer. Right now it's all just a set of specifications, which British Gas has published in the hope that other industry players will implement kit to the same standard, but the company is committed to connecting up at least two million homes by 2012. True interoperability might not be possible, but any level of compatibility will help smooth a change of supplier, and improve the economies of scale. The initial customers will be those who get both their 'leccy and gas from British Gas. Once wired up they will be able to take advantage of more complex tariffs and prepayment options to add credit that don't involve taking a mechanical key halfway across London on Boxing day*. British Gas reckons we'll be more prepared to run our washing machines at night if we can see the units clocking up at a different rate, so time-dependent tariffs are central to the specs which call for a touch-screen display allowing users to manage their energy consumption and, inevitability, reduce their carbon footprint. Using ZigBee also opens the way for the smart meter to notify the washing machine that the tariff has changed, or ask the freezer to shut down for bit to reduce demand until the wind picks up. Those options aren't covered by the specifications, and ZigBee will have to prove itself in the home before anyone's going to commit to the standard. Even British Gas is lukewarm on the technology, admitting: "We anticipate that Zigbee may not be suitable for all homes, and that developments or other methods may be needed to establish a HAN [Home Area Network]". That's despite the fact that ZigBee is expected to give a gas meter a 10-year battery life - assuming it reports back every 30 minutes - which compares well with competing standards. ZigBee is ramping up again lately, and its ability to create a mesh network on demand is very compelling, though being stuck in the increasingly-crowded 2.4GHz band doesn't work in its favour. 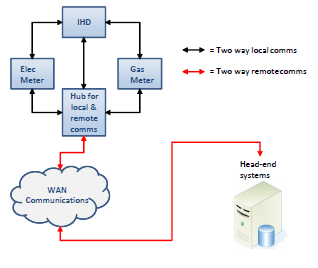 But the UK is committed to smart meters, and some form of home networking is therefore essential along with backhaul. It might seem insane to be using GPRS when every home in the UK is supposed to be getting broadband over the next few years, but it puts the end-to-end connection in the hands of British Gas and prevents customers blaming their ISP for dodgy meter readings. *Not an experience your correspondent would care to repeat, ever.